Fil-Chi Media Productions Inc., a lifestyle and television production company that aims to promote the Chinese culture as well as bridge the Chinese and Filipino communities through its weekly TV program, Chinoy TV on ABS-CBN News Channel (ANC), together with Miss Chinatown Foundation officially launched this year’s Mr. and Ms. Chinatown to formally commence the two-month journey towards of the pageant campaign towards the Coronation Night on September 2 at MOA Arena. Chinoy TV, Miss Chinatown Foundation and ABS-CBN. competition is the coronation night that will showcase the best in fitness, glamour and intellect. Best on ABS-CBN for its 5th year. Php.200,000.00, Php. 100,000.00, and Php. 50,000.00 worth of cash and prizes, respectively. 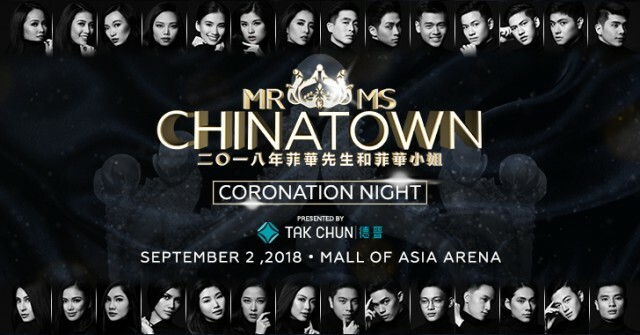 Mr. and Miss Chinatown 2018 is brought to you by Chinoy TV, Miss Chinatown Foundation, together with this year’s title sponsor, Tak Chun Group; and co-presented by the Federation of Filipino-Chinese Chamber of Commerce and Industry Inc.